The ESTEC Golf Club is a private club for those working at the Technical Centre of the European Space Agency (ESA), family members and retirees. Access to the course is restricted to Club members and their guests. The ESTEC Golf Club exists under the umbrella of the ESTEC SSCC. It is a C-Member of the Nederlandse Golf Federatie (NGF) and, through that, of the European Golf Association (EGA). 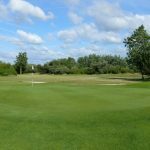 Our aim is to provide Club members and their guests with the opportunity to play golf in a friendly atmosphere at ESTEC and elsewhere.